Rich Nilsen, who has absolutely crushed some past big days, is back for both days of this year’s Breeders’ Cup at Churchill Downs, a track he knows inside and out. Included in Nilsen’s report are top selections for all 5 juvenile stakes on Friday and all 9 stakes on Saturday (all 14 Breeders’ Cup races). You receive Nilsen’s expert pace analysis, which is often the key to selecting the winner. Nilsen has 5 Spot Plays on the two days. He offers these best bets with his wagering strategies to attack these races. Get every Breeders’ Cup race for BOTH days (Friday & Saturday) in one sheet! Highlights from Previous Breeders’ Cup Spot Play Winners! $40.40 Spot Play Winner Work All Week with $1,064.70 Trifecta! $29.40 Sprint Spot Play Winner Trinniberg with Cold $203.40 Exacta! $15.80 Turf Sprint Spot Play Winner Mizdirection, keying $1,757.65 Pick-4 wager! 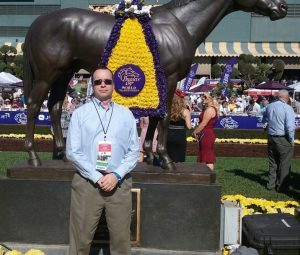 Nilsen has worked the past 26 years in the equine industry, serving most of those years as the Marketing Director for Brisnet.com and TwinSpires.com, the Official Wagering Site of the Kentucky Derby. The $2.8 Million National Handicapping Championship (NHC) is the premier horse racing tournament in the nation. It is basically horse racing’s version of the World Series of Poker, with the main difference being that players cannot buy their way into the NHC. Players can only win their way in via tournaments held throughout the country. Nilsen is one of the top participants in the history of the event, having qualified 15 times. He was the first player, and one of only a handful, to finish in the top 10 at the NHC twice. 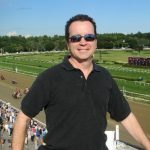 Nilsen is the founder and editor of AGameofSkill.com, a site devoted to horse racing education and promotion. He only provides selections like this on a few select days of the day. In this comprehensive yet concise report, I provide selections for all 14 Breeders’ Cup races for both days, as well as pace scenario analysis which is absolutely vital for predicting the outcomes of these events. 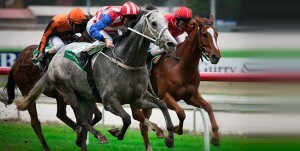 Spot Plays are my best bets and key wagering horses for the big weekend. Picking your spots is key to profiting on the races, especially when it comes to the Breeders’ Cup. The opportunities are plentiful but you improve your chances by selecting key spot plays and focusing most of your bets on those plays. 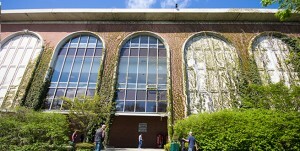 Set aside a budget for these two days and be sure to have plenty of ammunition for the bigger of the two days, Saturday. Best of luck! Spot Play City Of Light scored big in the Dirt Mile, keying the winning daily double into the next race. Amerman Racing’s four-time Grade 1 winner Oscar Performance continued his preparations for the $2 million Breeders’ Cup Mile (G1) at Churchill Downs on Nov. 3 by working 5 furlongs in company in 1:01 over a fast main track Wednesday morning at Keeneland. Working with Teryn It Up, a 3-year-old maiden, Oscar Performance edged in front at the wire as he completed his final quarter-mile in :24 with regular rider Jose Ortiz up. Oscar Performance, winner of the Ricoh Woodbine Mile (G1) in his most recent start Sept. 15, on Oct. 7 worked a half-mile in :52.20 on a turf course labeled good. He was scheduled for another grass work this past Sunday, but rainy conditions curtailed any turf activity. “You do what you can,” Lynch said of the missed grass work. “But he has worked well on the dirt, and this year he has never lost when I have worked him on the dirt before a race. Winner of the Breeders’ Cup Juvenile Turf (G1) at Santa Anita in 2016 and ninth in last year’s 1½-mile Breeders’ Cup Turf (G1) at Del Mar after setting the pace, Oscar Performance likely will have his final Breeders’ Cup work on the turf at Churchill Downs Oct. 28. Trainer Christophe Clement enjoyed a successful October Festival of Racing last Saturday at Belmont Park, saddling Disco Partner to an impressive victory in the $150,000 Belmont Turf Sprint Invitational followed two races later by Have At It, an 11-1 upset winner of the Grade 2, $500,000 Hill Prince. Patricia Generazio’s homebred Disco Partner reaffirmed his status as a top turf sprinter, besting a field of six for his second straight win in the Belmont Turf Sprint. It was his first start since finishing third in the Grade 3 Troy Handicap this summer at Saratoga Race Course. Returning $4.20 for a $2 win wager, the son of Disco Rico picked up his 11th win from 26 career starts, boosting his career earnings to $1,264,810. Clement said Disco Partner will likely target the Breeders’ Cup Turf Sprint on November 3 at Churchill Downs. He finished third in last year’s edition at Del Mar. Pure Sensation, winner of the 2016 Belmont Turf Sprint, was fifth in last year’s Breeders’ Cup. Clement applauded the performance by third-place finisher Pure Sensation, also owned and bred by Generazio, adding that he is possible for the Breeders’ Cup Turf Sprint as well. Margoth’s multiple graded-stakes winner Gunnevera breezed five furlongs Sunday morning at Gulfstream Park West in advance of his next anticipated start in the $6 million Breeders’ Cup Classic (G1) Nov. 3. With regular rider Edgard Zayas aboard, Gunnevera completed the distance in 1:02 over a wet-fast main track, second-fastest of 13 horses. It was his first work since overcoming a wide trip to rally from 11th and finish second to Yoshida in the Woodward (G1) Sept. 1 at Saratoga. Sano said Gunnevera will have another breeze next Sunday over his home track, this time in company, before heading to Churchill Downs Friday, Oct. 26. A 4-year-old son of Dialed In that has won earned more than $3 million, Gunnevera ran third in the $16 million Pegasus World Cup Invitational (G1) in January before sustaining a nasty foot injury while finishing off the board in the Dubai World Cup (G1) March 31. Given two months in Ocala to allow the foot to heal, he returned with a sharp 6 ½-length victory in an Aug. 10 optional claiming allowance at Gulfstream Park prior to the Woodward. Gunnevera finished in a dead heat for fifth with inaugural Pegasus winner Arrogate in last year’s Breeders’ Cup Classic. They were 6 ¼ lengths behind winner and 2018 Pegasus winner Gun Runner. Godolphin’s 5-year-old, 2.8-1 favorite Fine Needle (JPN) closed powerfully in the last 100 yards under jockey Yuga Kawada to collar 3-year-old filly Love Kampf (JPN) at the wire to win Sunday’s six furlong, $2,169,091 Sprinters Stakes (G1) at Nakayama Racecourse by a neck, and earned an automatic berth into the Breeders’ Cup Turf Sprint through the international Breeders’ Cup Challenge. 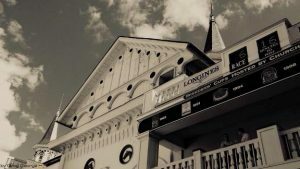 The Breeders’ Cup Challenge is an international series of 85 stakes races whose winners receive automatic starting positions and fees paid into a corresponding race of the Breeders’ Cup World Championships, which will be held at Churchill Downs in Louisville, Kentucky on Nov. 2-3. 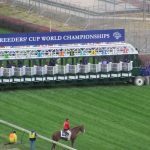 As part of the benefits of the Challenge series, Breeders’ Cup will pay the entry fees for Fine Needle to start in the $1 million Turf Sprint, a Grade 1 race run at 5 ½ furlongs on turf, for three-3-year-olds and up, at Churchill Downs on Nov.3. 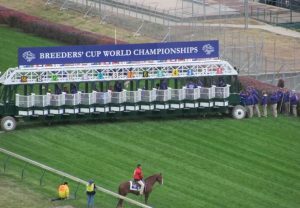 Breeders’ Cup also is providing all starters based outside of North Americas with a $40,000 travel allowance to compete in the World Championships. Fine Needle joins Disco Partner, who won the Jaipur Invitational (G2) at Belmont Park in June and Havana Grey (GB), who captured the Derrinstown Stud Flying Five (G1) earlier this month at Leopardstown as the other Turf Sprint “Win and You’re In” contenders. Today’s 52nd Sprinters Stakes was run under rainy conditions with a huge typhoon closing in. Once in a Moon (JPN) gunned for the lead in the 16-horse field and set the pace. Fine Needle, trained by Yoshitada Takahashi, broke from post 8 and was settled in mid-field and three-wide. Shifting farther out in the last turn to avoid traffic, he unleashed his trademark turn of foot all the way to the wire while picking off his rivals one by one and finally catching Love Kampf in the final strides to win by a neck. Sent off at 31-1, Love Kampf broke sharply and chased the pace in second. Hitting the straight still in second and two-wide, she took over the lead from the pacesetter while shaking off second favorite Nac Venus (JPN) 100 meters out and dug in gamely but was pinned by the winner at the wire. Rhein Spirit (JPN) saved ground in third to fourth, struggled for room behind the battling front runners in the stretch, but broke through chasing Love Kampf in the final 50 meters, stretching his neck in front of Daimei Princess (JPN) to grab third. 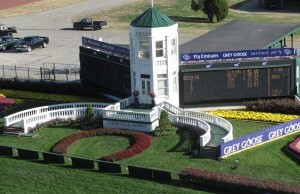 Fine Needle completed the six furlongs in 1:08.3 under a course listed as good. Fine Needle, a bay son of Admire Moon (JPN), won his fourth group stakes race is five starts this year. On Sept. 6, he came back after a four-month layoff to score an impressive 1 ½-length victory over Love Kampf at Hanshin in the six-furlong Centaur Stakes (G2). He began 2018 by winning the six-furlong Silk Road Stakes (G3) at Kyoto by two lengths on Jan. 28, and returned in March to take the Group 1 Takamatsumomiya Kinen at Chukyo by a nose. His lone defeat this year was in Hong Kong in late April where he finished fourth, beaten four lengths in the Group 1 Chairman’s Prize at Sha Tin. Fine Needle was bred by Darley Japan KK.